Successful promotional campaigns depend on reaching the right audience with the right message at the right time. Get your business in the game with affordable TV advertising teaching customers in Elkader, Guttenberg, Garnavillo, and Marquette in addition to thousands of customers across the state. ICAN, Inc. works with independent telephone companies to help area businesses develop markets through the use of cable TV networks such as HGTV, Discover, ESPN, and Fox News. 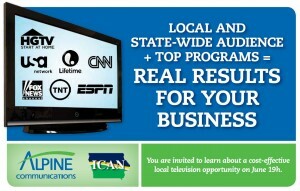 Alpine Communications is partnering with ICAN to offer a special program designed to help our local businesses take advantage of these national networks and more! Thursday, June 19 at 7:30 a.m.
Thursday, June 19 at 5:15 p.m.
Hors d’oeuvres will be provided. Each session will last one hour . The morning session will be held in Guttenberg at the River Park Place and the late-afternoon session will be held in Marquette at the Cobblestone Inn. Space is limited so RSVP’s are necessary. Please call Alpine at (563) 245-4000 or send an e-mail to alpine@alpinecom.net to reserve a seat.